For other uses, see Acis and Galatea (disambiguation). "Acis" redirects here. For other uses, see ACIS (disambiguation). Acis and Galatea is a story from Greek mythology that originally appeared in Ovid's Metamorphoses. 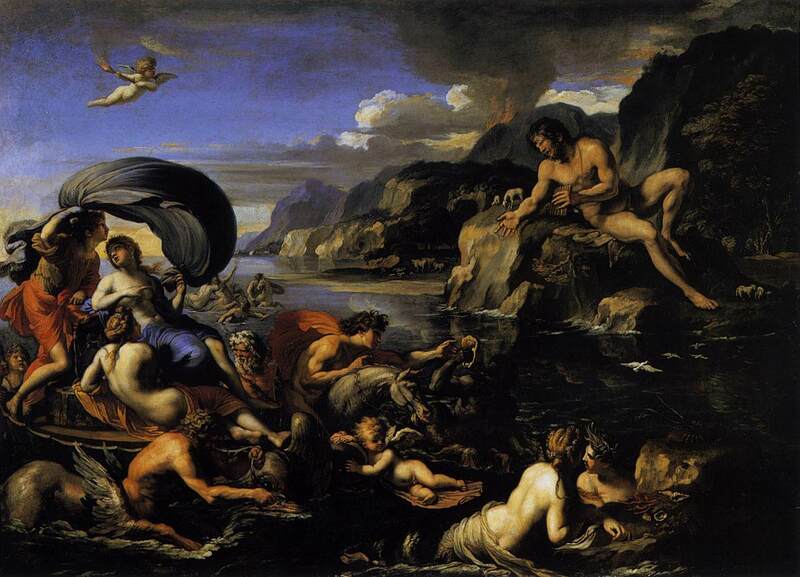 The story tells of the love between the mortal Acis and the Nereid (sea-nymph) Galatea; when the jealous Cyclops Polyphemus kills Acis, Galatea transforms her lover into an immortal river spirit. The episode was made the subject of poems, operas, paintings, and statues in the Renaissance and after. Galatea (Γαλάτεια; "she who is milk-white"), daughter of Nereus and Doris, was a sea-nymph anciently attested in the work of both Homer and Hesiod, where she is described as the fairest and most beloved of the 50 Nereids. 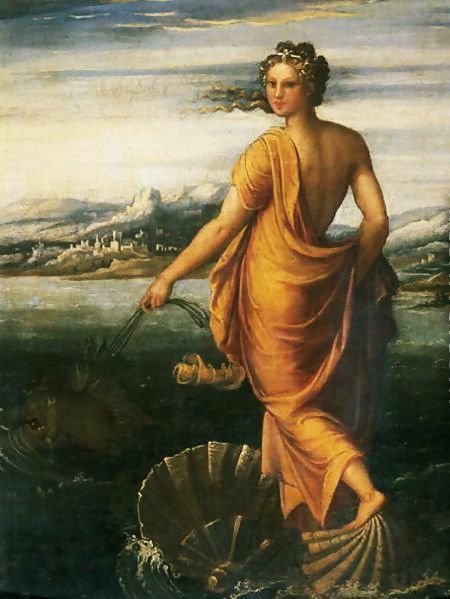 In Ovid's Metamorphoses she appears as the beloved of Acis, the son of Faunus and the river-nymph Symaethis, daughter of the River Symaethus. When a jealous rival, the Sicilian Cyclops Polyphemus, killed him with a boulder, Galatea then turned his blood into the Sicilian River Acis, of which he became the spirit. This version of the tale occurs nowhere earlier and may be a fiction invented by Ovid, "suggested by the manner in which the little river springs forth from under a rock". According to Athenaeus, ca 200 CE, the story was first concocted by Philoxenus of Cythera as a political satire against the Sicilian tyrant Dionysius I of Syracuse, whose favourite concubine, Galatea, shared her name with the nymph. Others claim the story was invented to explain the presence of a shrine dedicated to Galatea on Mount Etna. During Renaissance and Baroque times the story emerged once more as a popular theme. In Spain, Luis de Góngora y Argote wrote the much-admired narrative poem, Fábula de Polifemo y Galatea, published in 1627. It is particularly noted for its depiction of landscape and for the sensual description of the love of Acis and Galatea. It was written in homage to an earlier and rather shorter narrative with the same title by Luis Carillo y Sotomayor (1611) The story was also given operatic treatment in the very popular zarzuela of Antoni Lliteres Carrió (1708). The atmosphere here is lighter and enlivened by the inclusion of the clowns Momo and Tisbe. In France, Jean-Baptiste Lully devoted his opera Acis et Galatée (1686) to their love. Described by him as a pastoral-heroic work, it depicts a love triangle between the three main characters - Acis, Galatea, and Poliphème. Poliphème murders Acis out of jealousy, but Acis is revived and turned into a river by Neptune. In Italy Giovanni Bononcini's one-act opera Polifemo followed in 1703. Shortly afterwards George Frideric Handel was working in that country and composed the cantata Aci, Galatea e Polifemo (1708), laying as much emphasis on the part of Polifemo as on the lovers. Written in Italian, Polifemo's deep bass solo Fra l'ombre e gl'orrori (From horrid shades) establishes his character from the start. After Handel's move to England, he gave the story a new treatment in his pastoral opera Acis and Galatea with an English libretto provided by John Gay. Initially composed in 1718, the work went through many revisions and was later to be given updated orchestrations by both Mozart and Mendelssohn. As a pastoral work where Polyphemus plays only a minor, though decisive part, it largely centres on the two lovers. In Austria later in the century, Joseph Haydn composed Acide e Galatea (1763). Designed for an imperial wedding, it was given a happier ending centred on the transformation scene after the murder of Acis as the pair declare their undying love. Paintings featuring Acis and Galatea can be grouped according to their themes. Most notably the story takes place within a pastoral landscape in which the figures are almost incidental. This is particularly so in Nicolas Poussin's Landscape with Polyphemus (1649)(Hermitage Museum) and Claude Lorrain's seaside landscape (Dresden) of 1657, in both of which the lovers play a minor part in the foreground. In an earlier painting by Poussin (National Gallery of Ireland, 1630) the couple is among several embracing figures in the foreground, shielded from view of Polyphemus, who is playing his flute higher up the slope. The nymph sports on the peaceful sea, driving a team of four dolphins yoked together and working in harmony; and maiden-daughters of Triton, Galatea's servants, guide them, curving them in if they try to do anything mischievous or contrary to the rein. She holds over her heads against the wind a light scarf of sea-purple to provide a shade for herself and a sail for her chariot, and from it a kind of radiance falls upon her forehead and her head, though no white more charming than the bloom on her cheek; her hair is not tossed by the breeze, for it is so moist that it is proof against the wind. And lo, her right elbow stands out and her white forearm is bent back, while she rests her fingers on her delicate shoulder, and her arms are gently rounded, and her breasts project, nor yet is beauty lacking in her thigh. Her foot, with the graceful part that ends in it, is painted as on the sea and it lightly touches the water as if it were the rudder guiding her chariot. Her eyes are wonderful, for they have a kind of distant look that travels as far as the sea extends. In those cases where the rejected lover Polyphemus appears somewhere ashore, the division between them is emphasised by their being identified with their respective elements, sea, and land. Typical examples of this were painted by Francois Perrier, Giovanni Lanfranco and Jean-Baptiste van Loo. Sensual portrayals of the lovers embracing in a landscape were provided by French painters especially, as in those by Charles de La Fosse (c. 1700), Jean-François de Troy and Alexandre Charles Guillemot (1827). Polyphemus lurks in the background of these and in the example by De Troy his presence plainly distresses Galatea. Other French examples by Antoine Jean Gros (1833) and Édouard Zier (1877) show the lovers hiding in a cave and peering anxiously out at him. They anticipate the tragic moment when he looms menacingly over the pair, having discovered the truth they have tried to conceal. The threat is as apparent in Jean-Francois de Troy's softly outlined 18th-century vision as it is in Odilon Redon's almost Surrealist painting of 1900. The brooding atmosphere in these suggests the violent action which is to follow. 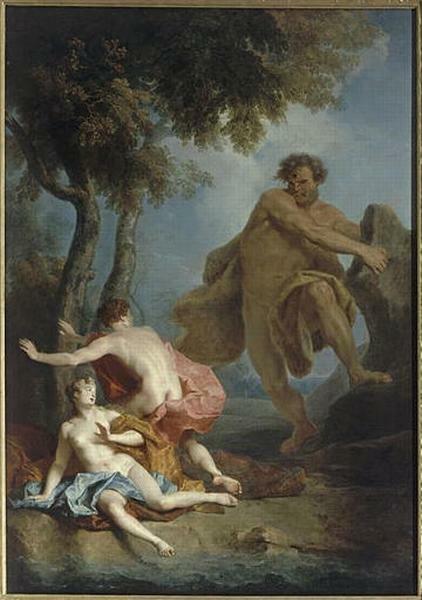 That had been portrayed in earlier paintings of Polyphemus casting a rock at the fleeing lovers, such as those by Annibale Carracci, Auger Lucas [fr] and Carle van Loo. Being drawn to the top of the fountain, the water passed through many pipes in various forms, then falling into the cistern beneath, it boiled with the force of its falling and waxed green like the sea. In the midst whereof, Galatea, as in the sea, bewailed her newly dead Acis, who lay on the shore, and as if he now began to be dissolved into a river, he sent forth two streams, one at his mouth, the other at his wound. An actual statue by a pool in the public gardens of Acireale, the Sicilian town where the transformation of Acis is supposed to have taken place, is less ingenious. He lies beneath the boulder that has killed him while Galatea crouches to one side, an arm raised to heaven in supplication. French sculptors have also been responsible for some memorable statues. There are a pair by Jean-Baptiste Tuby in the Bosquet des Dômes in the Versailles gardens. Acis leans on a rock, casually playing the flute, as the half-clad Galatea comes upon him with hands lifted in surprise (1667–75). A similar gesture is displayed in the statue of her alone in the fountain to the right of the great staircase at Château de Chantilly. The lovers are portrayed together as part of the Medici Fountain in the Luxembourg Garden in Paris. Designed by Auguste Ottin in 1866, the marble group embrace inside a grotto while above them is crouched a huge Polyphemus in weathered bronze, peering down in jealousy. Many other statues feature Galatea alone, but there is a complication. Some time after the Renaissance, the same name was given to Pygmalion's animated statue and one has to distinguish between representations of her and of the nymph Galatea. One pointer is given by the introduction of features mentioned in the description of the nymph by Philostratus that is quoted above. These include one hand raised and holding a billowing scarf; sea imagery, including shells, dolphins and tritons; and often the fact that the statue is incorporated into a fountain. In the work by Gabriel de Grupello in the castle park at Schwetzingen, the triton at Galatea's feet holds up a garland threaded with shells and pearls. The Galatea in the grounds of Tsarskoye Selo in Russia has sea pearls threaded into her hair. There is also a statue of her by Nicola Michetti that forms part of the cascade at the Peterhof Palace in St Petersburg. The nymph reclines on a large shell carried by tritons in the 18th-century fountain at the Villa Borromeo Visconti Litta in Milan. It is on the back of a dolphin that she reclines in the statue by the 19th-century Italian sculptor Leopoldo Ansiglioni (1832–1894). There are two versions of this, one at the centre of a fish pool in the East House of the University of Greenwich's Winter Gardens, and a later copy installed at Hearst Castle in California. In this, one of the arms bent back to support her head is encircled by the dolphin's tail. There is also a German fountain by Karl Friedrich Moest now installed in Karlsruhe in which Galatea sits on the back of a triton. Over her head she balances the huge shell from which the water pours. Another statue was erected at the head of an impressive cascade in Stuttgart's Eugenplatz. A work of Otto Rieth (1858–1911) dating from 1890, it features the nymph crowned with seaweed and surging up from the dolphin and young cupids playing at her feet. In the applied arts, three-dimensional representations of Raphael's triumph theme were often incorporated into artifacts for aristocratic use and were painted on majolica ware. ^ Hesiod, Theogony; Homer, Iliad. ^ Selected Poems of Luis de Góngora. University of Chicago. 2008. p. 176ff. ^ "Selected Poems of Luis de Góngora" (PDF). biblioteca-antologica.org. Archived from the original (PDF) on 2013-05-12. Retrieved 2013-09-02. ^ "Presto Classical - Lully: Acis et Galatée - DG Archiv: E4534972 (download) - Buy online". prestoclassical.co.uk. ^ "Martina Bovet: Dove sei, dove t'ascondi; G. B. Bononcini (Polifemo) - YouTube". youtube.com. Retrieved 2014-09-12. ^ "Aci, Galatea e Polifemo - Fra l'ombre e gl'orrori - YouTube". youtube.com. Retrieved 2014-09-12. ^ "Giovanni Lanfranco Galatea and Polyphemus Painting Reproduction On Artclon For Sale - Buy Art Reproductions Galatea and Polyphemus". artclon.com. ^ Christie?s. "Jean-François de Troy (Paris 1679-1752 Rome)". christies.com. ^ "The Athenaeum - The Loves of Acis and Galatea (Alexandre Charles Guillemot - )". the-athenaeum.org. ^ ALL. "Acis And Galatea by AntoineJean Gros, 1833. BonzaSheila Presents The Art Of Love Archives For February, 2006". bonzasheila.com. ^ "polyphemus and Acis and Galatea.gif - tribe.net". Archived from the original on 2014-02-02. Retrieved 2014-09-12. ^ "Wave/image/joconde/0640/m507704_02-014751_p". culture.gouv.fr. Retrieved 2014-09-12. ^ "Polyphemus attacking Acis and Galatea (after) Loo, Carle van | Oil Painting Reproduction | 1st-Art-Gallery.com". 1st-art-gallery.com. Retrieved 2014-09-12. ^ Barkley, John (2004). Argenis (Mark Riley and Dorothy Pritchard Huber's translation). Assen NL. p. 155. ^ "Galatea | Flickr - Photo Sharing!". flickr.com. Retrieved 2014-09-12. ^ "Hearst Castle Statue - Galatea on a Dolphin by Leopoldo Ansiglioni photo - Rich Gardner photos at pbase.com". pbase.com. Retrieved 2014-09-12. Grimal, Pierre (1986). The Dictionary of Classical Mythology. Oxford: Basil Blackwell. ISBN 0-631-20102-5. This article incorporates text from a publication now in the public domain: Smith, William, ed. (1870). "Acis". Dictionary of Greek and Roman Biography and Mythology. This page was last edited on 12 March 2019, at 14:07 (UTC).